Love of popular culture runs deep and a great example is this fun and ultimately moving new documentary. Boston-area journalist, critic and film-studies professor Gerald Peary seeks out the possible and probable real-life inspirations for the characters of the ever-popular “Archie” comic books. In the process, he reveals a hidden human dimension behind the iconic faces of Archie Andrews, his dueling love interests Betty and Veronica, and others like Jughead, Reggie and Moose. This is a project that actually dates back to 1988 when Peary, who had been a big Archie fan since his boyhood in West Virginia, wrote an article in the Boston Globe Sunday magazine that positioned Haverhill, MA as the inspiration for the comic’s fictional Riverdale. Archie’s original artist, Bob Montana, had attended Haverhill High School in the 1930s and Geary’s scrutinizing of early issues (the first Archie appeared in 1941) reveals named local landmarks were later fictionalized, like the gang’s beloved Chock’lit Shoppe. Geary tracked down several of Montana’s old classmates that could have been prototypes for the major characters and had himself a nice feature story. But an urge to further explore this subject eventually led Peary to make this, his second film (the first was the 2009 doc about the art of film criticism called “For the Love of Movies”). He revisits many of the Haverhill classmates and locations while partnering with amateur comics historian Shaun Clancy, who became the film’s co-producer. It was Clancy who suggests that Betty—the blonde girl-next-door who’s always playing second fiddle to affluent Veronica for Archie’s affections—was not based on Montana’s Haverhill prom date but an actual woman named Betty that he dated in his twenties after he had moved to New York City and was already a working cartoonist. The film sweetly concludes with the two of them visiting the 90 year-old Betty at her assisted living facility in New Jersey where she proves to be every bit as plucky and personable as her illustrated namesake. 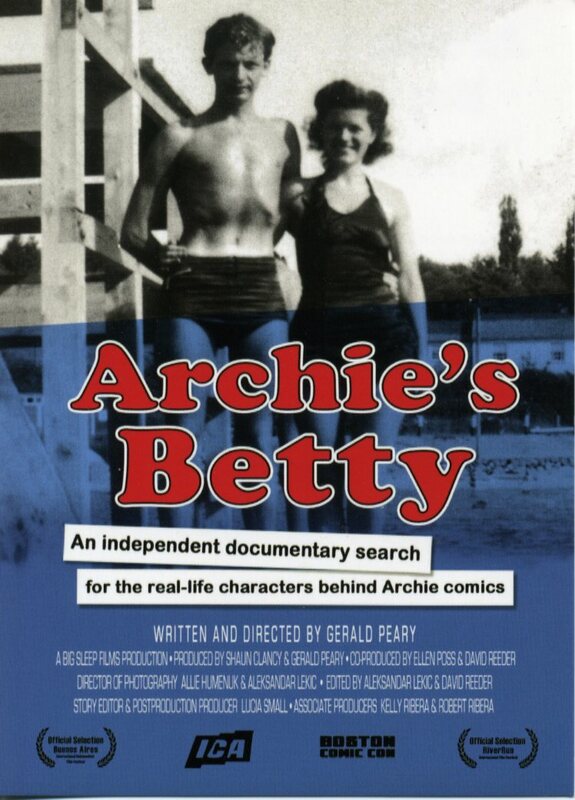 “Archie’s Betty” is an engaging blend of archival visuals, firsthand recollections, expert viewpoints and Peary’s own personal angle. His empathy for the inner connections people make with fictional characters and settings, and how they can develop from simple childhood escapism to something more profound with the passage of time, is the thread that will make his film appeal to viewers far beyond the ranks of Archie fanatics.